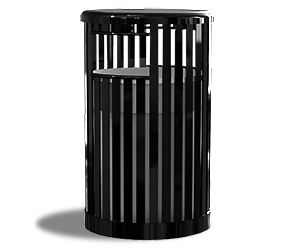 Stylish, yet durable the Kensington Collection round trash receptacles offer a modern aesthetic, built ready for long lasting performance. Precision crafted with 1-1/2" vertical slats, the dual 6-3/4"H x 12"W rectangular side-disposal openings provide ample access to discard litter. The flat top lid fabricated from 18-gauge steel and spun to form fits snuggly helping contain and conceal contents. Each receptacle is MIG welded and finished in an ultra-resilient powder-coating. The 36 gallon trash receptacle is popular for individual placement and large scale multi-site applications with matching park benches, round and square picnic tables from the Kensington Collection.